"Kiy" redirects here. For the Russian island, see Kiy Island. This article is about the history of Kiev. For the former political prisoner, see Aung San Suu Kyi. Kyi, Shchek and Khoryv (Ukrainian: Кий, Щек, Хорив [ˈkɪj, ˈʃt͡ʃɛk, xoˈrɪw]; Old East Slavic: Кыи, Щекъ, Хоривъ) are three legendary brothers often mentioned along with their sister Lybid (Ukrainian: Либідь [ˈlɪbidʲ]; Old East Slavic: Лыбѣдь), who, according to the Primary Chronicle, were the founders of the medieval city of Kyiv, now the capital of Ukraine. There is no precise and historically established information about rule of Kyi and establishment of the city of Kiev. Many historians consider as truthful the existence of Kyi and his princely rule around the 6th century. Among such historians are Boris Rybakov, Dmitry Likhachov, Aleksey Shakhmatov, Alexander Presnyakov, Petro Tolochko, Nataliia Polonska-Vasylenko, and others. The legend is widely recognized as a source of Kyivan mythology and urban naming. In the Primary Chronicle which is traditionally believed to have been written by a monk of Kyiv Cave Monastery by the name of Nestor and finished in 1113, a special place is held by the legend about the foundation of Kyiv by three brothers. In the legend, Nestor places those brothers onto various hills of Kyiv. Geographically, the old Kyiv is located on a higher right bank of Dnieper which is an extension of the Dnieper Upland where remnants of the Church of the Tithes are located. The chronicle further states that there were people ("who did not know what were saying") who considered Kyi a mere ferryman. But, then it argues that Kyi as a prince of his gens was visiting Czargrad and received great honors from the Emperor. Dmitry Likhachov combined attestations of the Nikon Chronicle which also indicates that Kyi with a great army marched onto Czargrad and received great honors from the Emperor. During his expedition to Constantinople, Kyi also found a city of Kyivets on the Danube. Nestor also names the approximate date of the assault on Kyiv by the Khazar Empire as "after the death of Kyi" which confirms the hypothesis of Boris Rybakov, 6-7thth centuries. In his chronicle Nestor doesn't indicate dates of the Kyi's death nor existence or absence of his heirs who continued to rule after his death. The chronicle does mention about a meeting between local residents with the arrived Askold and Dir who asked them referring to Kiev, whose city it was and received the answer that three brothers who built it long died and the residents now pay tribute to Khazars. However, the Polish historian Jan Długosz drew attention to the Przemysł Chronicle that asserts "after the death of Kyi, Shchek, and Khoryv their children and grandchildren who descended from them by direct lineage ruled for many years". 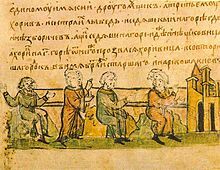 Also, the Primary Chronicle indicates that the Byzantine Empire knew the land around of Kyiv as Rus land no later than 852 CE before appearance of Rurik who was also of Rus people (Varangian nation). И быша . г҃ . брата . а А єдиному имѧ Кии . а другому Щекъ . а третьєму Хоривъ . и сестра ихъ Лыбѣдь . и сѣдѧше Кии на горѣ кдѣ н҃нѣ оувозъ Боричевъ . а Щекъ сѣдѧше на горѣ . кдѣ ннѣ зоветсѧ Щековица . а Хоривъ на третьєи горѣ . ѿнюдүже прозвасѧ Хоривıца . створиша городокъ . во имѧ брата ихъ старѣишаго . и наркоша и Києвъ . и бѧше ѡколо города лѣсъ и боръ великъ . и бѧху ловѧще звѣрь . Б бѧхуть бо мудрѣ и смыслени. и нарицихусѧ Полѧне . — ЛѢТОПИСЬ ПО ИПАТЬЕВСКОМУ СПИСКУ, ПСРЛ. — Т. 2. Ипатьевская летопись. — СПб., 1908. — Стлб. 1-21.
before the time of these brothers there were already Polyanians, and each one lived with his gens on his own lands, ruling over his kinsfolk), there were three brothers, Kyi, Shchek, and Khoriv, and their sister was named Lybed’. Kyi lived upon the hill where the Borichev trail now is, and Shchek dwelt upon the hill now named Shchekovitsa, while on the third resided Khoriv, after whom this hill is named Khorevitsa. They built a town and named it Kyivv after their oldest brother. Around the town lay a wood and a great pine-forest in which they used to catch wild beasts. These men were wise and prudent; they were called Polyanians, and there are Polyanians descended from them living in Kyiv to this day. Archaeological excavations have shown that there was indeed an ancient settlement starting with the 6th century. Some speculate that Kyi was a real person, a knyaz (prince) from the tribe of the Polans. According to legend, Kyi, the eldest brother, was a Polianian Prince, and the city was named after him.. As well, the legend says that the appearance of a large city on the hilly banks of the Dnieper was predicted by Andrew the Apostle. This legend has similar Armenian transcript from the 7th-8th century, in which Khoryv is mentioned as Horean. Khoryv or Horiv, and his oronym Khorevytsia, some scholars related to the ethnonym of White Croats. Paščenko related his name, beside to the Croatian ethnonym, also to solar deity Hors. Near Kiev there's a stream where previously existed large homonymous village Horvatka or Hrovatka (destroyed in the time of Joseph Stalin), which flows into Stuhna River. The sculpture of Kyiv founders depicted on Ukraine's interim bank note in 1990s. In addition to the respective hills and the river, there are Shchekavytska and Khoryva Streets in Kyiv's ancient neighborhood of Podil. In 1982, Kyi, Shchek, Khoryv and Lybid were depicted (standing on an ancient riverboat) in a sculpture at the river-side of Navodnytsky Park. The monument, created by Vasyl Borodai, soon became iconic for the city and has been used as Kyiv's unofficial emblem. In the 2000s another statue was installed at the central square, Maidan Nezalezhnosti. ^ a b c d e f g h i j k l m Oleh Yastrubov. "And gave it its name Kyiv". Newspaper "Den". 14 July 2006. ^ a b Malyckij, Oleksandr (2006). "Hrvati u uvodnom nedatiranom dijelu Nestorove kronike "Povijest minulih ljeta"" [Croats in the introductory non-dated part of the Nestor's chronicle "History of the past years"]. In Nosić, Milan. Bijeli Hrvati I [White Croats I] (in Croatian). Maveda. pp. 106–107. ISBN 953-7029-04-2. ^ Strižak, Oleksij (2006). "Sorbi, Srbi, Hrvati i Ukrajina" [Sorbs, Serbs, Croats and Ukraine]. In Nosić, Milan. Bijeli Hrvati I [White Croats I] (in Croatian). Maveda. pp. 106–107. ISBN 953-7029-04-2.